Steam ahead the mussels, clams, lobsters, and razors separately. Clean and discard the shells. Place water in a large pot and bring to a boil. Whisk in the cold butter until emulsified. Season with salt and pepper and keep warm. Poach bay scallops in soup and add in other shellfish. Warm the honey and water in a saucepan until dissolved together. Using a hand mixer, add in the egg yolk and mix together, keeping the emulsion quite warm. Place in serving bowls and garnish with caviar and a spoon full of honey emulsion. Thank you to Menton and chef Barbara Lynch for this recipe. This delicious nutty butter is perfect to cook poultry or any kind of white meat. It also tastes great on toast or a slice of banana bread. 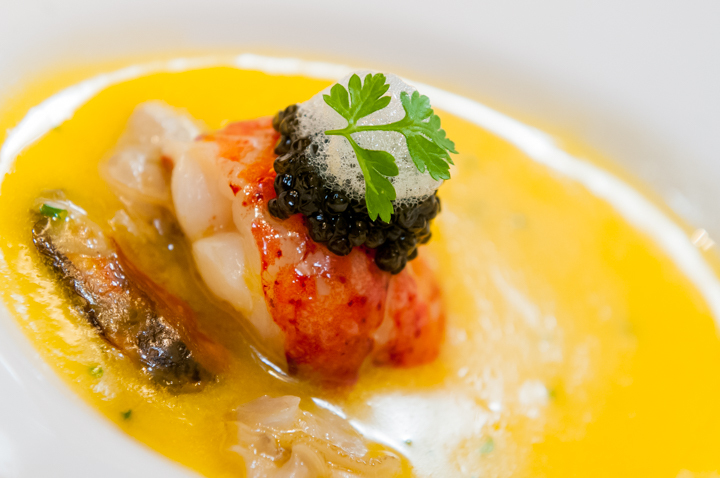 Thank you to Epicure and chef Eric Frechon for this recipe. I posted about them here. This recipe was shared in a serving size fit for a restaurant, I divided the original recipe ingredients by eight. This butter looks like it will be very rich due to it's dark color, but it has a delicious subtle flavor. Allow butter to soften to room temperature. Add molasses and salt to butter and stir until fully mixed. Serve with warm biscuits or on pancakes. Thank you to Seersucker for this recipe. I posted about them here. This recipe was shared in a serving size fit for a restaurant, I divided the original recipe ingredients by four. This aromatic butter is a classic sauce for gnocchi and squash ravioli. Don’t be afraid to use whole sage leaves here—when they hit the hot butter, they become crisp like chips and their flavor mellows considerably. Heat a small, heavy saucepan over medium heat until very hot. Add the butter and cook, stirring constantly, for 4 to 5 minutes, or until browned. Remove pan from the heat; add the sage, salt, and pepper; and stir until the bubbling subsides. Serve the butter warm. This butter keeps for several days tightly sealed in the refrigerator or several weeks in the freezer. I was delighted to find the website Churncraft. Finally someone who adored butter as much as I do, enough to create a website about it. Churncraft was launched by Kristin and Hannes Frey in 2013. With help from their two daughters, the website offers lessons on making homemade butter, a wide variety of compound butter recipes and a blog filled with interesting information and beautiful photography. They have created a modern, mechanical butter churn. Coming soon! I'm going to order one. I'll let you know when I get it. All three dried chiles used in this recipe are mild in terms of heat, but each one brings a distinct flavor to the mix. They can be found at Mexican markets and some gourmet grocery stores. Steak, pork chops, salmon, shrimp, roasted winter squash, baked sweet potatoes, corn on the cob, warm corn or flour tortillas, and popcorn are all good uses for this earthy, Mexican-inspired butter. Heat a medium-size, heavy sauté pan or griddle over medium heat until very hot. Add the chiles and toast, pressing down on them firmly with a spatula, for 10 to 15 seconds, or until golden brown. Turn the chiles and continue to toast, pressing down on them firmly with a spatula, another 10 to 15 seconds, or until fragrant, golden brown, and pliable. Remove the toasted chiles to a bowl, add enough boiling water to cover, and let soak for 10 to 12 minutes, or until rehydrated. Transfer the chiles and 2 tablespoons of the soaking liquid to a blender and blend until smooth. Force the chiles through a fine-mesh sieve to remove the skins and seeds. Blend together the chile puree, butter, garlic, salt, and cumin in a medium-size bowl. Form into a log and refrigerate until firm before slicing and serving, or use another shaping method. This recipe is from the cookbook Flavored Butters. I bought it a few years ago and it is filled with fantastic compound butter recipes. I am excited to be adding a butter recipe section to my website. This will include compound butters and sauces. The recipes will come from my kitchen, from cookbooks (with permission) and many of the chefs were kind enough to share recipes with me, and I will share them with you.